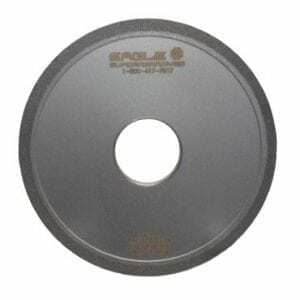 Diamond Sharpening Wheels Supplier | Eagle Superabrasives Inc.
Eagle Superabrasives is a premier supplier of diamond sharpening wheels located in the United States. With an extensive inventory of over 6,000 grinding wheels in stock, we are able to ship ninety-percent of orders same-day. Custom orders can be filled in as little as seven days. Diamond is the hardest material known to man, so it would only make sense to use it for sharpening purposes. Eagle Superabrasives offers Polycrystalline Diamond with a vitrified bond. Our diamond wheels come in a variety of sizes and grits that will ensure they fit your business needs. The bond system incorporates sintered vitreous materials with carefully selected diamond to provide both a mechanical and chemical bonding of the abrasive particle to the bond structure, minimizing the diamond pull out. Diamond Sharpening Wheels advantages are shown by their strength, good wear resistance and a low friction coefficient. Diamond can be used in grinding wheels as well as sharpening wheels. Diamond Sharpening Wheels generate less heat which decreases the burns and cracks on the surface of the workpiece, and decrease equipment wear. The dimension of the wheel itself barely changes, leading to great grinding quality and high grinding precision. The lifespan of the wheel is also greater than conventional wheels, increasing the work efficiency, and improve the products labor intensity. The combination of these advantages will ensure that you save money and increase your productivity rate. Our chemist and engineers work constantly on developing new solutions for bonding, so that our wheels provide a long life and work life. When you’re ready to try the best, trust the experts at Eagle Superabrasives. You can expect unparalleled customer support and service, give us a call. Our experienced staff is dedicated to providing our customers with high quality products and unequaled service. We offer experienced technical support and advice to assist you along the way.